Each year about 1,000 people convene in San Diego for a four-day conference focused on changing the world. Really. When you have a ballroom full of people whose jobs contain the word sustainable in the title, there is going to be quite a lot of focus on what’s wrong with the planet and what they are all doing (and the rest of us should be doing) to fix it. This was my first time at Sustainable Brands and I walked away both depressed and inspired. Oh and I learned a lot about trash. And recycling. And innovative ways of creating things out of other things. And zero waste. And how to change the 4 trillion tons of plastic on the planet into currency rather than tossed as waste. It’s not news that art can influence behavior and we saw a couple of examples that I loved. Prince Ea, who calls himself a content creator (I call him a world changer, awakener, artist) told us the story of his video which went viral faster than anything he had ever done, helped boost his online presence, and supercharged his other message-based videos on YouTube. What he learned after several false starts in attempting to create shareable content is that when you come from the heart, you reach the heart. That level of authenticity is what broke through for him online. It’s something to think about when creating content you hope will be shared. Eduardo Srur, creates what he calls ‘Urban Interventions’ with his art. Based in Sao Paulo, a city of 10 million people, he has seen what a lack of recycling (only 3% of garbage is recycled in Brazil) and disregard for nature can do to a country and its people. 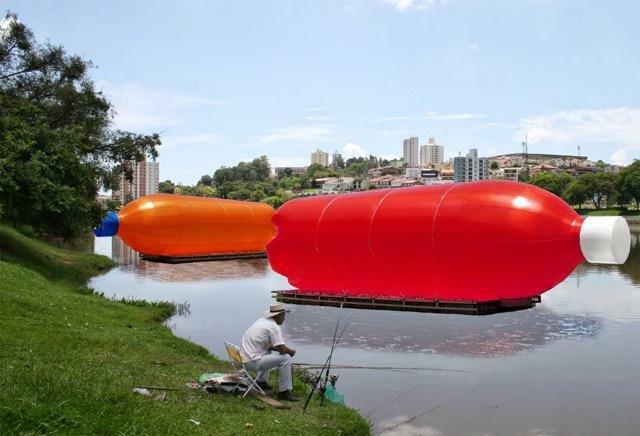 Rather than just sit back and accept it, he has challenged it head on, with incredible installations like his PET project in which he placed enormous, brightly colored plastic bottles along a dead river to showcase what plastic has done to what was once a vibrant waterfront enjoyed by city residents. Srur believes that art “is the possibility of rescue”. Brazil is lucky to have someone who cares so much. Walking away from Sustainable Brands I was acutely aware of how my everyday actions matter. Artists like Prince Ea and Eduardo Srur spread that message with inspiration and emotionally acuity.